Having discovered King Cole Tinsel chunky yarn I wanted to make a Christmas tea cosy. I was inspired by Christmas trimmings. You know in the middle of December when you go up into the loft to get the Christmas decorations down so that you can decorate the house? Don't you always find that the tinsel and fairy lights have got knotted up together? 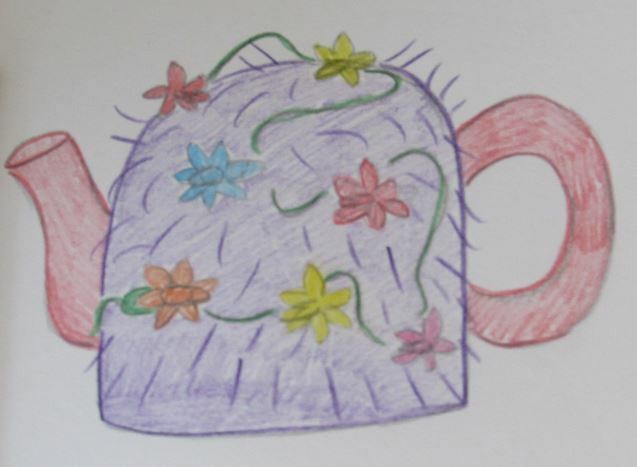 This is what I wanted to create as a contemporary Christmas tea cosy design. I love our decorations; some are very old and very precious and remind me of bygone Christmases. I particularly love vintage fairy light, because they transport me back to my childhood in the 70’s. The little lantern fairy lights remind me of my primary school and they huge Christmas trees in the main hall. And flower like fairy lights remind me of the small silver Christmas tree we had of kids that sat proud of place on top of the telly. I used to like the pink and turquoise lights the best. So my new Christmas tea cosy design will be a knot of Christmas tinsel and fairy lights. I have had a few requests for large tea cosy knitting patterns to fit a 10 cup sized teapot, so I thought I’d make this tea cosy in three sizes, small, medium and large; perfect sizes to knit for your own tea cosy in any size and perfect for gift giving too.